Ascorsine-9® Professional Formula contains 30 servings per jar (serving size is two scoops daily), and each jar contains 379 grams of Ascorsine-9 powder per jar. One jar will last for one month at the Pauling-recommended preventive dose of 3,000 mg vitamin C and lysine daily. Two jars will provide Pauling's recommended therapeutic dosage for persons with known heart disease, which is 6,000 mg vitamin C and lysine daily. Designed to be mixed with 8 ounces of water. It is not advisable to take any Pauling Therapy formula with fiber. Also, Ascorsine-9 should never be taken with sugary soft drinks, simple carbohydrate foods (white potatoes, white bread, white rice, pasta, etc. ), or even fruit drinks if you are diabetic or insulin resistant, as vitamin C is crowded out when serum (blood) glucose levels are elevated. See The Pauling Therapy - Does It Work for Everyone? Recommended for established and advanced heart disease. Formerly available only through physicians, A-9 contains the basic ingredients found in HeartTech® plus magnesium creatine, chondroitin sulfate, taurine, more L-proline, more vitamin A, and more vitamin B6. Select from 1 jar (preventive) to 2-3 jars (therapeutic) of Ascorsine-9® and/or HeartTech® per month. One jar (preventive) of A-9 per month replaces more than 1,000 separate pills per month, avoiding unnecessary fillers and binders. Two jars (therapeutic) of A-9 per month replace more than 2,000 pills and 13 to 14 different pill bottles, making Ascorsine-9® the most convenient product on the market for achieving the Pauling-recommended dosages. Many Tower customers have reported that they prefer the taste of A-9 to the original. 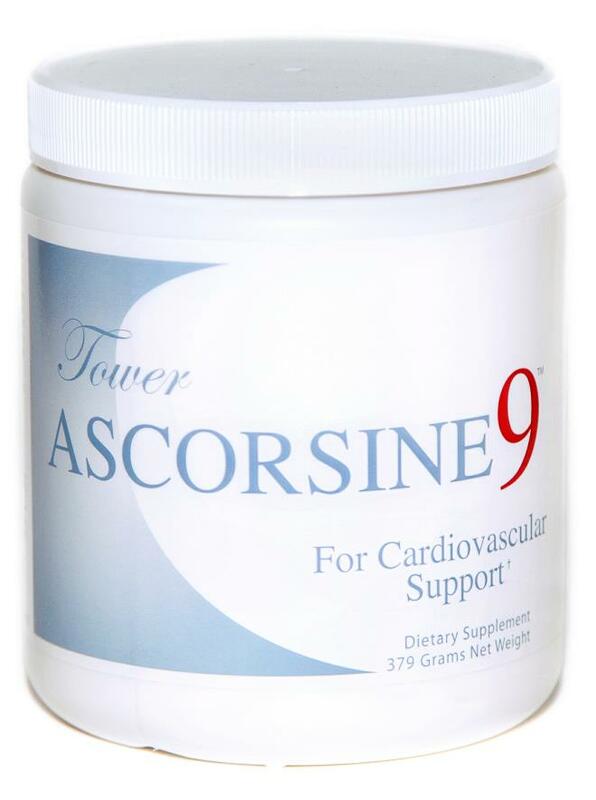 In 2001 Tower introduced its most powerful mix, Ascorsine-9®, (PRONOUNCED AS-COR-SEEN) which provides every supplement found in the original Heart Technology™ formula plus additional nutritional supplements that are recommended by experts in the field of medicine for optimal cardiovascular health including Albion Labs' Magnapower magnesium. creatine, taurine, more L-proline, more vitamin A, more vitamin B6, and the latest recommendation, chondroitin sulfate. Today, those with established or advanced heart disease benefit the most from Ascorsine-9® as their initial therapeutic formula. **Creatine Magnesium Chelate supplied by Albion Advanced Nutrition. Chelate covered under Albion International, Inc., U.S. Patent #5,114,379. At the 'orthomolecular' dosages recommended by experts Linus Pauling, Ph.D., and Thomas Levy., M.D., J.D., the ingredients in Tower's most potent formula Ascorsine-9® add considerable bulk and would normally require many large pills or capsules. For example, the tasty A-9 drink mix replaces more than 1,000 separate pills per month and consequently eliminates all of the unnecessary fillers, binders and preservatives. The therapeutic two A-9 jars monthly replace more than 2,000 pills and 13-14 different pill bottles, making A-9 the most convenient product on the market for achieving the recommended Pauling therapy dosages. This is good news for those who have difficulty swallowing pills or experience the dry mouth frequently associated with aging. How is A-9® Different from HeartTech®? Ascorsine-9® contains every supplement found in the original Heart Technology™ formula plus additional nutritional supplements that are recommended by experts in the field of medicine for optimal cardiovascular health including magnesium. creatine, taurine, more L-proline, more vitamin A, more vitamin B6, and the latest recommendation, chondroitin sulfate. Chondroitin sulfate is a mucopolysaccharide comprised of the same material as the heart membranes that repairs and revascularizes the microcirulation of the heart membranes and the wall of the heart muscle (the myocardium). Chondroitin sulfate is especially important for aging individuals and individuals with Type I and Type II diabetes because they are subject to microangiopathy, which is narrowing of the small and capillary blood vessels in the heart muscle itself. Microangiopathy also affects other tissues including the nervous system, which is why long-term diabetics suffer from neuropathy. Much of the enhanced formula is based on the published clinical information and dosages provided by Board-certified cardiologist Dr. Thomas Levy in his recent book, Stop America's #1 Killer! What are the Benefits of Ascorsine-9®? Serving size is 2 scoops per day in divided doses.